Here we are providing a video on Picture Interaction : How the Picture Interaction goes in a Classroom from one of the Primary Class Text Books , by Mrs Ramani SRG. 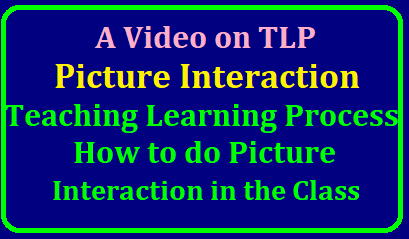 As the Primary Teachers at the ground level we are facing many difficulties on how to do picture interaction effectively , here this video will make us to know us very clearly on how to do tlp on picture interaction effectively . We all teachers are very much thankful to Mrs Ramani for providing such a wonderful video which will give a clear idea on the steps involved in transacting the picture interaction with students. The process producing a description for bridging the gap between the slow learners and the fast learners. 1. Select a Picture that has scope for writinga discription and a rich source for interacting with the students. 2. Here the facilitator has chosen a picture in which children are seen playing different games in a playground. 3. The facilitator asks the student to look at the picture carefully and meanwhile, divides the board into three parts... making sure that that middle part is wider than the other two parts. 4. Now she asks questions related to elciiting names of persons, places and things and writes them one by one on the left side, pronuncing each word carefully and in an intelligible way (syllabically). Then, the facilitaror focuses on the actions in the picture. She interacts asking questions, eliciting responses from the learners and writes the action words one by one on the right side. 6. Now the facilitator asks the same questions to see that the learner can use the naming words from the elft side and the action words from the right side to construct sentences for the questions the facilitaror asks. The facilitaror encourages the learners to write those sentences on the blackboard. After writing a few sentences, the facilitator can take up editing the sentences and fill the missing words. Children enjoy reading picture books from the very beginning of learning a language. From the very first introduction to listening to English, children can enjoy carefully selected picture books. Young learners soon pick up the short text of a picture book, if initially it is shared with an adult who brings the pages alive. Children are already familiar with stories. From a very young age they talk in narrative style. It is through their stories of everyday experiences that they define themselves: expressing their ideas, hopes and emotions in language as well as in drawing and imaginative play. Many children are already used to decoding stories and information from television or film in their home language, while others may have already enjoyed the interaction of sharing a picture book. Most children, if guided by a parent, soon work out how to transfer their individual decoding skills to get meaning from picture books in English. Sharing picture books is not only about picking up another language, it is also about giving children a wider window on the world, guided by their parents. The one-to-one interaction of sharing picture books gives children added opportunities to develop holistically at their own speed and level, knowing that their parents are encouraging them. As children share more and more books their self-confidence develops. This can often be seen in the way they approach unfamiliar English and new experiences. It takes time to build up a child’s readiness to talk about picture books in English. Children’s silence, however, does not mean that they are not listening and learning. Children usually understand more than they can say in words and, if the book experience is focused and fun, they usually want to pick up the new English at their own speed. Children are busy exploring their world and most are keen to find out something new, particularly if it is presented in an encouraging and attractive way.